Expanding Erik Skodvin's extremely limited 2008 cassette edition Penpals Forever, this CD release remasters the original content and adds a whole extra side's worth of new material. 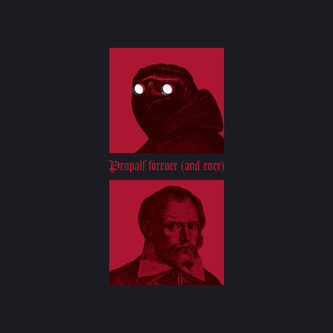 You wouldn't necessarily discern this straight away from the Deaf Center member's elusive and teasingly enigmatic music, but apparently 'Penpals Forever And Ever' is an "imaginary tale of a long dead baroque painter and his telekinetic correspondence with a flightless bird." It all seems so obvious in hindsight. The revamped sleeve art helps point the way towards this sort of archaic, suggestively supernatural imagery, particularly thanks to a brilliantly sinister etching that crops up on the back-cover. This is a release that really starts to sound like it looks too, quickly assuming a brilliantly grim analogue language that floods the speakers with hiss, and unbelievable pitch-black reverberations. The first side throws you into this bleak auditory realm head first, with exhumed renaissance-era string plucks haunting the vinyl grooves before dispersing into the smudginess of Skodvin's droned-out backdrop - a kind of sonic Rorschach test within which you might make out veiled recordings of birds squawking and other such subconscious-ransacking sounds. The new compositions continue in the same deathly vein, offering mist-shrouded structures that only reinforce Skodvin's position at the very top of the dark-ambient tree. There are three new pieces in all, encompassing a range of sounds that calls upon vaporising groans, plunging percussive rumbles and lost threads of guitar that meander around discordantly in the darkness. Marvellous stuff all round.